AUSTIN, Texas — The American Institute of CPAs (AICPA) announced Michael Granof, professor at The University of Texas at Austin, as the recipient of the 2017 AICPA Distinguished Achievement in Accounting Education Award. 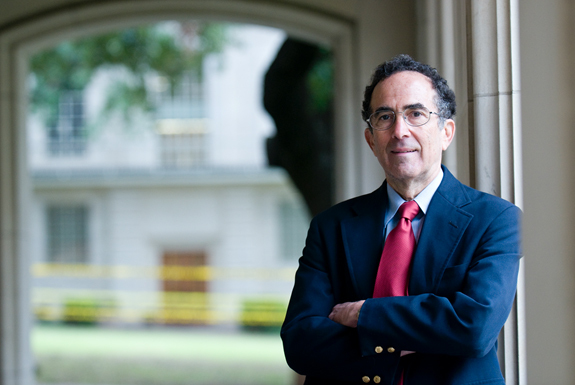 Granof holds a joint appointment at the LBJ School of Public Affairs and the McCombs School of Business as the University Distinguished Teaching Professor and the Ernst & Young Distinguished Centennial Professor in Accounting, respectively. The award, presented annually since 1985, recognizes full-time college accounting educators distinguished for excellence in teaching and for national prominence in the accounting profession. The award has a dual function: to extend profession-wide recognition and promote role models in academia. Granof was honored this week at the annual meeting of the American Accounting Association (AAA) in San Diego. Granof’s contributions to public education extend beyond the classroom. He has played an active role in professional standard-setting and university governance, published countless professional articles, opinion pieces, textbooks, and co-authored one of the leading texts in the field, “Government and Not-for-Profit Accounting: Concepts and Practices.” Granof is also the only academic to have served concurrently on both the Governmental Accounting Standards Board (GASB) and the Federal Accounting Standards Advisory Board (FASAB). “The contributions that Professor Granof has made as an educator and author have benefitted the accounting profession immensely. He is truly deserving of this award,” said Steve Matzke, AICPA director of faculty and university initiatives.